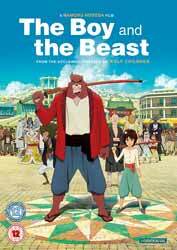 The Boy and The Beast (2015. 1 hr, 54 min, 13 sec) is an anime fantasy film written and directed by Mamoru Hosoda (The Girl Who Leapt Through Time (2006), Summer Wars (2009), Wolf Children (2012)). Thematically the film deals with the idea of family, what it means and how it works, even outside of your blood kin. Although the two don’t seem to get along, both are headstrong, which leads to a lot of arguing. Both are strong, in their own way, but more importantly, they are both lonely. When Kumatetsu takes Ren as a pupil, all he is thinking of is winning the great contest to become the next lord. His only rival, Lord Louzan, is everything Kumatetsu seems not to be. Equally as strong he is also a devoted father and calm in battle, where Kumatetsu is rash, relying on brute strength to win. He hardly ever wins, which is why he cannot find a pupil amongst the children of the beast world. The two make for the perfect odd couple. Ren, renamed Kyuta, is an annoying brat, whiny and impatient. Kumatetsu is a lazy slob who does not have the patience to train his pupil let alone keep his house tidy. Their initial relationship is based upon the conflict between them and it is only when the high lord sends the two on a road trip to discover the meaning of strength do the two move to a more competitive stance. Kyuta grows fast and soon becomes a young man, but his argumentative relationship with Kumatetsu drives him back into the world of men. There he meets Kaede, a schoolgirl of his own age who is willing to teach him. Another bond is born in their relationship, one that will be pivotal in the film's climatic battle. The idea of yin yang is central to the film's plot with many of the characters seemingly being poles apart only to find a dialectic which works for them. This motif is also used in the depictions of the two worlds. The world of men is muted in colour compared to the riot represented in Shibuten. The animation in the film looks beautiful and there is some judicious use of 3D animation to give street scenes and backgrounds a much-needed depth. The film looks as good as it can on a DVD and the lack of extras mean that the file has not had to be compressed too much There is a generous number of audio tracks including, Japanese/English DD 2.0, Japanese/English DD 5.1 as well as English subtitles and Hard of Hearing subs.